How can I check my revenue log history? HOME > REVENUE AREA > How can I check my revenue log history? STEP 1: Go to the REVENUE tab. STEP 2: On the left side navigation bar, select the option TOOLS. 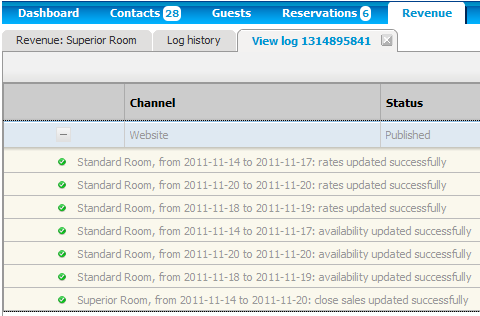 STEP 3: Now click on LOG HISTORY. On this list you will be able to see who and when a specific change was done. STEP 5: In order to see the details, select the relevant line and double click on it or click OPEN. STEP 6: If you click on this symbol ( ) you will be able to see full details on the changes done. Please pay attention to the STATUS column, especially in case you get a INCOMPLETE (yellow) or FAILED (red) warning. This means there was an error or an incomplete task occurred during the revenue publishing process. On these cases we recomend you to see the full details within the specific line. This list is displayed in chronological order, from the newest to the oldest action, but you can invert the display order by clicking on the DATE column. You can also use the navigation pages and take advantage of the FILTER option. This list can also be sent to excel format, but bear in mind that currently only the generic information is exported.